The aim of this lecture is to present on Present Continuous Tense. Such actions which are happening at time of speaking are expressed by present continuous tense. The sentence describes a development from one situation to another. Signal words are not that common here, only sometimes the change of situation is emphasized by using more and more. 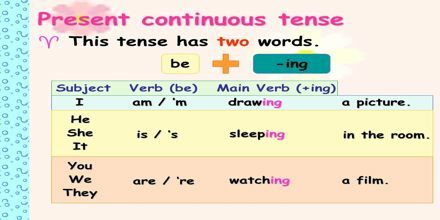 Present Continuous tense is also called Present progressive tense. Rules. Auxiliary verb “am or is or are” is used in sentence. 1st form of verb or base verb + ing (present participle) is used as main verb in sentence.